Over the years I’ve made hundreds of desserts, but surprisingly, this is my first batch of homemade pudding ever. Perhaps because instant Jell-O has degraded pudding into something that we, an Americans, never make from scratch anymore. It comes as either a dry box mixed with milk, or in shelf-stable, pre-made little plastic cups. I had the idea to make chocolate pudding a year ago, when I made this Coffee Flan. 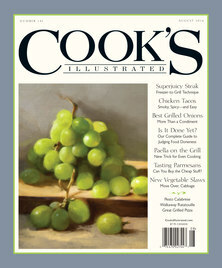 Then a few months ago Cook’s Illustrated published an updated pudding recipe (their previous recipe was 15 years old). Today’s pudding is made with real ingredients and is delicious. There are several variations, but I love the addition of Coffee flavor to chocolate. The recipe took under 30 minutes to make (plus 4 hours to cool). 4-stars. Great flavor and texture, without the skin on top that mars my memories of my childhood pudding. Later this week I plan to make chocolate mousse with my son, for his high school French class’s Christmas Party. I am saving a bit of the pudding to compare flavors between the two desserts. Obvious the mousse with have a lighter texture. I don’t have Kahlua, so I skipped substituted an equal amount of Brandy. The brandy worked well to give it some depth, but overall the mocha pudding lacked coffee flavor. The first time I made this recipe the pudding did not set, because I tried to set it in an ice chest rather than the refrigerator. The 4 hours of setting time in Step 6 must be undisturbed refrigerator time; I would even suggest putting in the bottom shelf of the refrigerator because it is the coldest part. Start time 1:30PM. Dinner time 6 PM. In a very small bowl, mix together vanilla extract and espresso powder; set aside. In large saucepan, whisk together sugar, cocoa, cornstarch, Kahlúa, and salt. Whisk in yolks and cream until fully incorporated, making sure to use a rubber spatula to scrape corners of saucepan. Whisk in milk and coffee until incorporated. Set saucepan over medium burner; cook for 8 to 12 minutes, whisking constantly. The mixture needs to be bubbling over its entire surface. Cook for 30 seconds longer, then remove from heat. Add butter and chocolate to pot. Whisk until melted and becomes fully incorporated. Remove from burner and whisk in vanilla mixture. Pour pudding through fine-mesh strainer into bowl. Press lightly greased parchment paper or plastic wrap directly against the surface of pudding. Set on bottom shelf of refrigerator to cool and thicken for at least 4 hours. Whisk pudding briefly and serve. While Cracker Jacks are available in every supermarket in America, it only takes a little effort to make homemade. Of course, fresh cooked popcorn taste so much better than popcorn that was popped in a factory 6 months prior. The freshness will become immediately apparent with your first bite. Each box of Cracker Jacks is only 1-ounce, and provides as natural stopping point. The biggest problem is that you will have a hard-time stopping. This recipe yields the equivalent of 28-boxes, so I have learned to break it down into 6 or 7 zip-lock bags. It’s absolutely delicious. 5-stars. 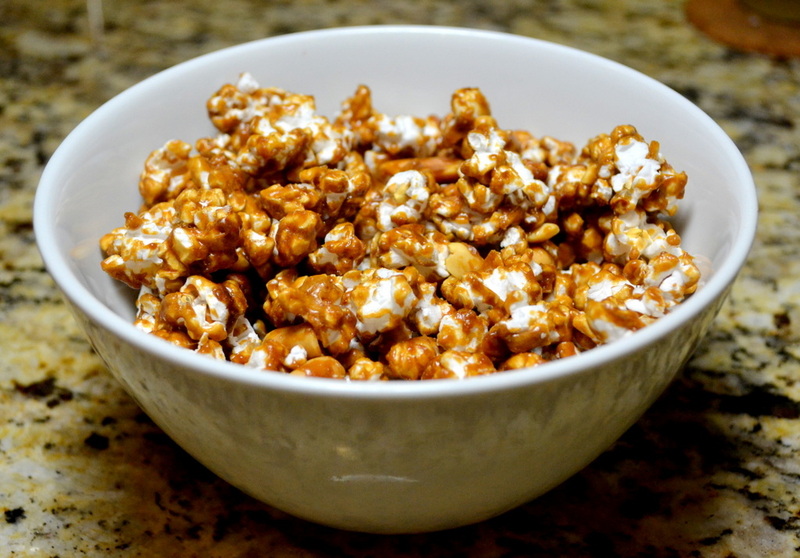 Chris Kimball does have a similar recipe for Butter Toffee Popcorn, but my goal with this recipe was to make something special for my kids (for kids Cracker Jack’s are better than Butter Toffee Popcorn). The main differences are that Chris Kimball calls for 1/2-stick more butter and 1/4-cup less corn syrup. Plus Cracker Jacks include molasses. You can pop your popcorn in any way you want. I prefer to use a hot air popper, since it doesn’t add any oil. I found it very easy to coat/bake the popped popcorn in a large roasting pan. But you could use anything: a disposable aluminum pan, a large metal bowl, or two cookie sheets. While I used lightly salted cocktail peanuts, the most Cracker Jack-like peanut is to use Spanish Peanuts (with red skin still intact). I have even used dry-roasted peanuts; but I recommend using lightly salted nuts. Full-salt Planters will taste much saltier than Cracker Jacks; but perhaps a more gourmet balance of sweet to salty. Cleaning up after making caramel doesn’t have to be difficult. I boil water in the pots and the caramel stuck to the bottom of the pan will eventually dissolve. To clean my roasting pan I set over two burners to boil the water. Cost: $3.75 for 1-3/4 lbs (4-quarts). Start time 4:00 PM. Ready at 5:15 PM. Adjust a rack to the middle of your oven, and preheat to 250-degrees. Pop the popcorn (my preferred method is with a hot air popper). Grease large roasting pan, and use your hands to evenly spread the popped popcorn in a large roasting pan; leaving behind and discarding any “old maids” (un-and-under-popped kernels). Place in oven until ready to coat in Step 4. In a 2-quart saucepan, combine butter, brown sugar, corn syrup, molasses and salt. Set over medium burner, bring the mixture to a boil; stirring frequently. Cook for 12 to 14 minutes until the mixture reaches 255-260 degrees; using a cooking thermometer to take the temperature. Remove the popcorn from the oven. Working quickly, remove from heat and add vanilla extract and baking soda. Mix together and you will see the color change as the baking soda incorporates air into the mixture. 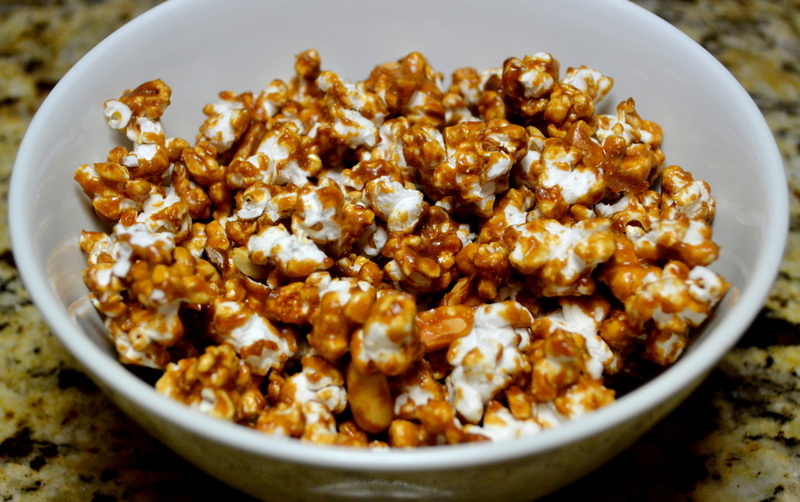 As evenly as possible, pour the caramel mixture over the popcorn and toss well to evenly coat all the popcorn (use two heatproof spatulas or wooden spoons; lightly buttered or sprayed with a non stick spray). Sprinkle with 1-1/2 cups of peanuts; continue to toss until become distributed. Return roasting pan to 250-degree oven and bake for 45 minutes, stirring well every 15 minutes. Try to evenly coat popcorn and gently break up slightly into smaller pieces. Allow to cool, and then break into smaller pieces. Evenly distribute between 6 or 7 zip-lock bags with as much air removed as possible. Chris Kimball says that it can be stored in an airtight container for 5 days; but it will never last that long. 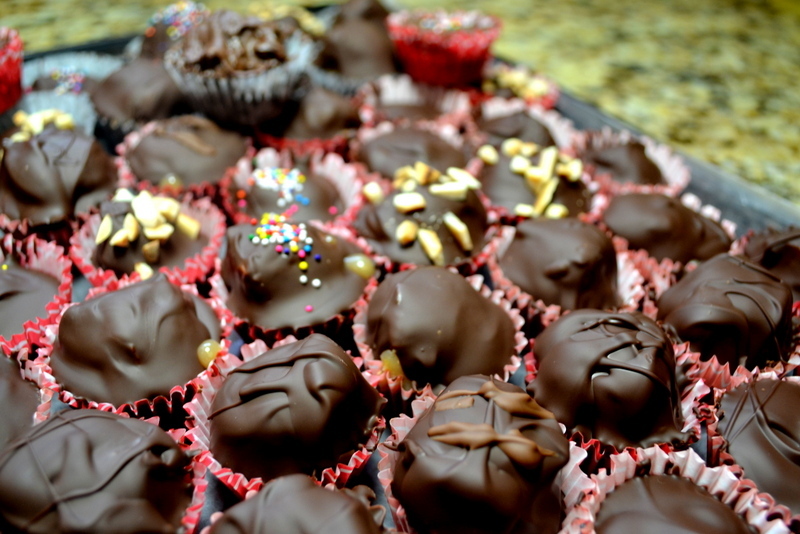 Last year, I made some amazing Valentine’s Day truffles. I pulled out all the stops and created something that I considered unique and amazing. This year, without an official Girl Friend, I almost didn’t make truffles. But I decided at the last-minute to make them, and I made them jointly together with my nearly-16-year-old son, who plans to give some to a friend of his. In a twist this year, I included a recipe that I have been experimenting with for the past 7 or 8 months; homemade Snickers. I know that I am not alone in my love of Snickers. Snickers are a combination of three different layers; each made separately and layered on-top of each other. First, I made the caramel. Then layered the nouget on top. I froze everything solid so that I could cut them into pieces without squishing the more delicate nougat. Finally topped with chocolate, which importantly makes the sticky middle layers much easier to eat. While I generally love dark chocolate, I didn’t like using exclusively dark chocolate with the taste of Snickers. I achieved a great, rich flavor using 50% dark chocolate and 50% milk chocolate. I used Belgian chocolate from Trader Joe’s ($4.50/lb). 500 grams of chocolate will cover about 30 truffles. While I tried a couple of times to make my own marshmallow, it was too delicate a process and I ultimately have changed the recipe to simply buy Marshmallow Fluff. I imagine that I could also use regular marshmallows, melted down, but Marshmallow Fluff works perfectly. I also considered using homemade dulce de leche instead of caramel; because it is so easy to make. While the texture is perfect, the flavor is slightly different. Ultimately I opted for caramel. If you are making snickers bars instead of truffle-sized treats, then melt 8 ounces of chocolate and pour over nouget (after the 20 minutes in the refrigerator). This will give a nice even base layer of chocolate. Cut into 2-3/4″-by-1″; yielding 24 bars. 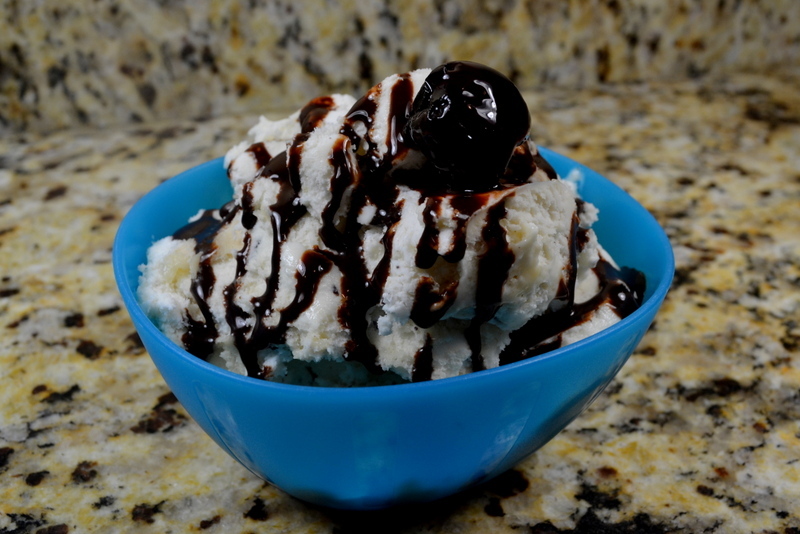 A few of the websites I used when working through this recipe include here and here. Start time: 10:00 AM. Finish time: 6:00 PM. Spray a 8″-by-8″ baking pan with cooking spray, then line with a 14″ long piece of parchment paper folded over to match the exact width of the bottom of the pan. Leave a few inches of overhang on each side. Then spray the parchment paper again (never use wax paper). Set aside. Fit a heavy-bottomed small-sized saucepan with a candy thermometer so that it is near, but not touching the bottom of the pan. Remove thermometer for the time being; only using it for the last few minutes (otherwise your thermometer will overheat). Add sugar, heavy cream, corn syrup, butter and kosher salt and set over medium-high burner. Stir mixture for 2 minutes until sugar completely dissolves. Use a wet pastry brush to wash down the inside of the pan to eliminate crystallization. Continue to boil , occasionally swirling the pan (but not stirring), and brushing to prevent crystallization, mixture for about 16 minutes until it reaches 260-degrees. Meanwhile roughly chop peanuts; roughly in half. Immediately remove the saucepan from heat, add peanuts, evaporated milk, and 1/2 teaspoon vanilla extract. Mix until the peanuts are evenly distributed. Pour caramel mixture into prepared pan using an oiled rubber spatula, spread evenly in the pan. Let cool for 30 minutes until caramel is no longer warm to the touch. Place in freezer until caramel is solid; about 3 hours. To fully clean the caramel from your pans it may be necessary to re-soften using boiling water. Melt butter in a saucepan over medium heat. Add in sugar and milk, stirring until dissolved and bring to a boil; about 1 minute. Cook for 5 minutes, stirring occasionally. Turn off heat and fold peanut butter until melted. Fold in fluff, and vanilla extract, stirring until smooth. Pour over bottom layer of caramel and allow to cool completely in refrigerator for 20 minutes. Freeze until solid for 3 hours. Use a paring knife to run along the sides without parchment. Use parchment sling to remove pan. Place on a cutting board with the caramel-side down, cut into appropriately sized pieces. Put back in freezer while you prepare the chocolate coating in the next section. Bring a saucepan filled with 2 inches of water to a simmer over high heat; once simmering, turn off heat. Place ALL BUT 6-OZ of chocolate in a dry heat-proof bowl. Set the bowl over the saucepan and stir until chocolate is completely melted and reaches 118°F. ; about 10 minutes. Meanwhile break the remaining chocolate into smallish pieces. When chocolate reaches 118°F, remove the bowl from the saucepan. Add remaining 6 ounces of chocolate and stir until all chocolate is melted and cools to 100°F. Do not remove the thermometer from the bowl. Keep the saucepan over low burner. As necessary, return the bowl to the saucepan to maintain the temperature between 95°F and 105°F. Fill each cup of a mini-cup-cake pan with mini-cup-cake-liners; which will help maintain the form while the chocolate cools. Spoon chocolate into each empty cup, add one square pushing down so that the chocolate squishes halfway up the sides. Top with another spoonful of chocolate to cover. Freeze for 5 minutes. Use the tines for a fork to help remove from mini-cup-cake pan. Repeat until your run out of chocolate. 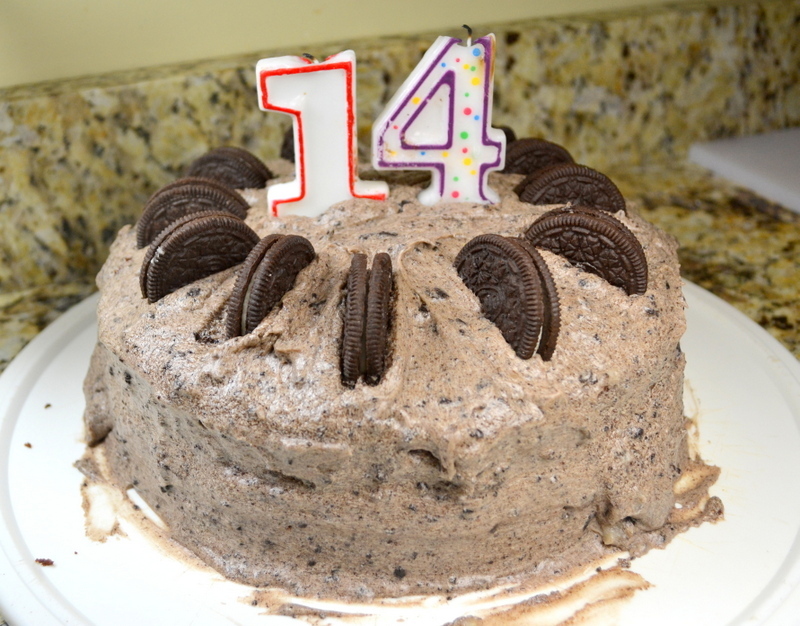 Today is my youngest son’s 14-th birthday, so I made this delicious birthday cake based upon his favorite food; Oreo cookies. For the first time ever, our neighbor Dante played happy birthday on the flute to accompany the singing. The cake required a bit of juggling to finish the cake on this workday evening, but the results were fantastic. The base cake was loosely follows Chris Kimball’s recipe, but the frosting was based upon this internet recipe. It used almost an entire package of Oreo cookies (which is now an absurd 14.3 ounces), which gave the cake authentic Oreo flavor. Overall 4-1/2 stars. Do not refrigerate the frosting. The results become completely un-spreadable. If you are going to cut some Oreo cooking in half for topping; use a serrated bread knife so that they don’t crumble. Start time 10 AM. Ready at 12 Noon . I usually substitute two double espressos (4 ounces, 1/2 cup) and reduce boiling water to 1 cup. Whatever you use, be sure that the total liquid equal 1-1/2 cups. Bring a pan with water to a boil. In a small bowl, mix together the powdered cocoa and instant coffee; pour in boiling water (and espresso) and mix until smooth. Allow to cool for 15 minutes before stirring in the vanilla. Pre-heat your oven to 350° and set an oven rack to the middle position. Cut two wax paper inserts to fit inside your two 8”x1-1/2” round cake pans. Rub some butter on pan sides and wax paper; lightly flour and tap out an excess. If your 2-1/2 sticks of butter are not fully softened, microwave them for 30 seconds. Beat butter in standing mixer equipped with paddle attachment at medium-high speed for 30 seconds; until it becomes smooth and shiny. With the mixer running, gradually sprinkle in sugar and mix for 3 minutes until it becomes fluffy and almost white in color. On at a time, add eggs and mix for 1 full minute after each addition. In a medium bowl, whisk together flour, baking soda, and salt. With mixer on lowest speed, add about 1/3 of dry ingredients to batter, and immediately add 1/3 of the liquid cocoa mixture. Mix just until the ingredients become nearly incorporated. Repeat flour/cocoa additions twice more. Turn off mixer and scrape down the sides of the bowl using a rubber spatula. Mix on low-speed for 15 seconds more; the batter will become smooth like satin. Evenly pour the batter between the two pans. Use a rubber spatula to work the batter to the sides and to smooth the top. Bake cakes at 350° for 25 minutes; until a toothpick comes out with only one or two crumbs. Transfer pans to wire racks, cool for 10 minutes. Run plastic knife around perimeter of each pan to loosen. Invert cakes onto wire rack, and allow to cool completely before frosting. Remove the wax paper AFTER the cakes have cooled. Add 1/2 cup flour and 1-1/2 cup cold milk to a small saucepan. Stir and whisk constantly over medium low burner for about 3 minutes until it becomes thick. Remove from heat and put in freeze for 10 minutes until completely cool. Meanwhile add Oreo cookies to food processor and pulse until evenly crushed, about 10 pulses. If your butter is not fully softened, microwave them for 30 seconds. Beat butter in standing mixer equipped with paddle attachment at medium-high speed for 30 seconds; until it becomes smooth and shiny. With the mixer running, gradually sprinkle in sugar and mix for 3 minutes until it becomes fluffy and almost white in color. Add in vanilla and mix for 30 seconds longer. Add the thickened milk/flour mixture and mix on low for about 30 seconds. Then turn the standing mixer to high and mix for about 3 minutes, or until the frosting is light and fluffy, much like whipped cream. Add crushed Oreos and mix for about 30 seconds. For me, holiday meals usually involve pulling out all the stops. Usually a week’s worth of planning and cooking. And so it was that I came to make this beautiful Apple Tart for Christmas, one of the most visually stunning desserts that I have ever made. The crust had 10 tablespoons of butter (so it’s got to be good). 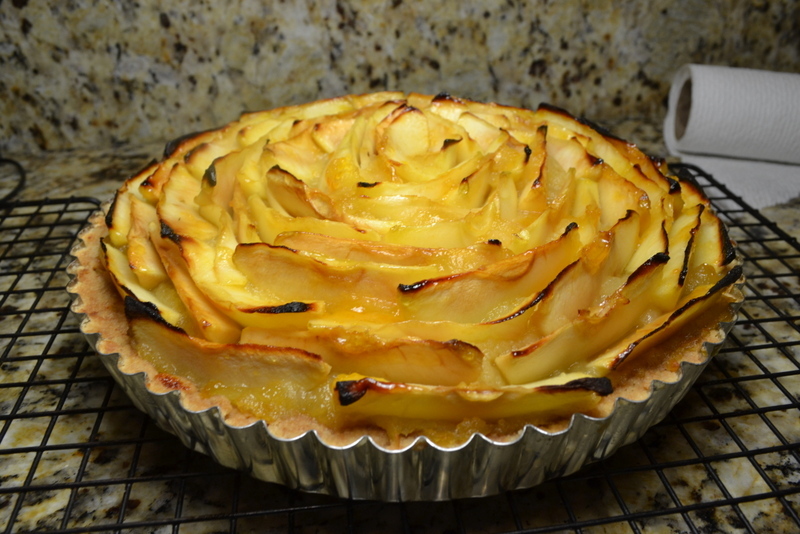 The tart used 5-pounds of apples, so it was destined to be filled with apple flavor. Inexplicably, against everything my eyes were telling me, I simply didn’t like the tart. Just 2-stars. At first, I thought that the desserts downfall primarily lay in the high visual expectations, coupled with the unpopular applesauce-like consistency of the puree used to hold the slices in place. All of my guests complained about the “applesauce”. But as I more closely examined the recipe I noticed a few ingredients were not part of the recipe. Most notably: sugar. While billed as a “tart”, its did not have any relief of the tartness of the green apples. Start time: 10:00 AM. End time: 12 PM. Put butter in a small sauce over low heat and allow to slowly melt; about 5 minutes. Also, set an oven rack to lowest position and another rack 5″-to-6″ from broiler element. Pre-heat the oven to 350 degrees. Whisk together the flour, sugar, and salt together in a medium bowl. Add melted butter and stir with stiff rubber spatula or wooden spoon until a dough forms. Using your hands, press two-thirds of dough into bottom of 9-inch tart pan with removable bottom. Press remaining dough into fluted sides of pan. Press and smooth dough with your hands to even thickness. Place pan on wire rack set in rimmed baking sheet and bake on lowest rack, until crust is deep golden brown and firm to touch, 30 to 35 minutes, rotating pan halfway through baking. Set aside until ready to fill. Peel and core 5 apples (remaining 5 will be used later). Cut lengthwise into quarters and cut each quarter lengthwise into 4 slices. Set 12″ skillet over medium heat and melt 1 tablespoon butter. Add apple slices and 1 Tablespoon water and toss to combine. Cover and cook, stirring occasionally, until apples begin to turn translucent and are slightly pliable, 3 to 5 minutes. Meanwhile, microwave apricot preserves for 30 seconds until they become fluid. Strain preserves through a fine-mesh strainer reserving the solids. Set aside 3 tablespoons of the strained preserves for brushing tart (most will be used for making the applesauce). Transfer apples to large plate, spread into single layer, and set aside to cool. Do not clean out the skillet. Peel and core the remaining 5 apples and slice into 1/2″-thick wedges. Melt 2 tablespoons butter in skillet over medium burner. Add the strained preserve, apricot solids, apple wedges and 1/4 teaspoon salt. Cover with lid and cook for 10 minutes; stirring a few times until the apples become very soft. Use a potato masher to mash into a puree and continue to cook for another 5 minutes until it has reduced to 2 cups. Put puree into baked tart shell and smooth. Select 5 or 6 of the thinnest sauteed apples to use in the center. Start at the outer edge of the tart, arrange slices in concentric circles, offsetting each circle so that the slices don’t line up. It will create the flower-like pattern. Use the thin, reserved slices to fit into the center. Bake at350 degrees for 30 minutes (still on the wire rack in sheet pan). Remove from oven and pre-heat broiler. Water the 3 tablespoons of preserve from Step 4 in microwave for 20 seconds. Evenly brust over the entire surfact of the apples, but avoiding the crust. Broil for 1 to 4 minutes until the apples are attractively browned. Allow tart to cool for 1-1/2 hours before removing from tart pan and serving. The Flan was truly impressive, but I was a little nervous that it would release properly and the caramel would be thick and fluid. I could not have asked for anything more. I liked the addition of espresso powder as it made the flan more interesting. The flan is very potent and this yields enough to serve a large crowd. 4-1/2 stars. For me the caramel cooking times were all considerably longer than specified in the recipe. The most critical thing was that I continued until I saw the reddish-amber hues specified in Step 3. Because my cooking times were noticeably longer when making the caramel, I used 3 tablespoons of water instead of 2 tablespoons specified in the recipe. My fear was that more of the water had an opportunity to evaporate and that the caramel might completely seize up in my loaf pan. The final consistency was perfect. I would recommend making your caramel in a stainless steel clad pot. I made mine in a Calphalon (anodized aluminum) pan, and it was difficult to see the color of the caramel to judge its readiness. The good news is that the reddish-amber color was easily spotted. Chris Kimball also has a variation using almonds (which uses 1 teaspoon almond extract in lieu of espresso powder). Or for a regular flan just omit the espresso powder. In a medium-sized saucepan, add 2/3 cup sugar and 1/4 cup water. Mix until sugar is completely wet. Put pan over medium-high burner and bring up to a boil (4 to 5 minutes). Cook without stirring for 2 to 3 minutes until it becomes golden brown. Gently swirl pan and continue to cook for another 2 minutes until it becomes the color of peanut butter. Remove for burner and swirl the pan until the mixture turns red-amber, about 15 to 20 seconds. Carefully add 2 tablespoons warm tap water, which will bubble a steam, and swirl until it becomes incorporated. 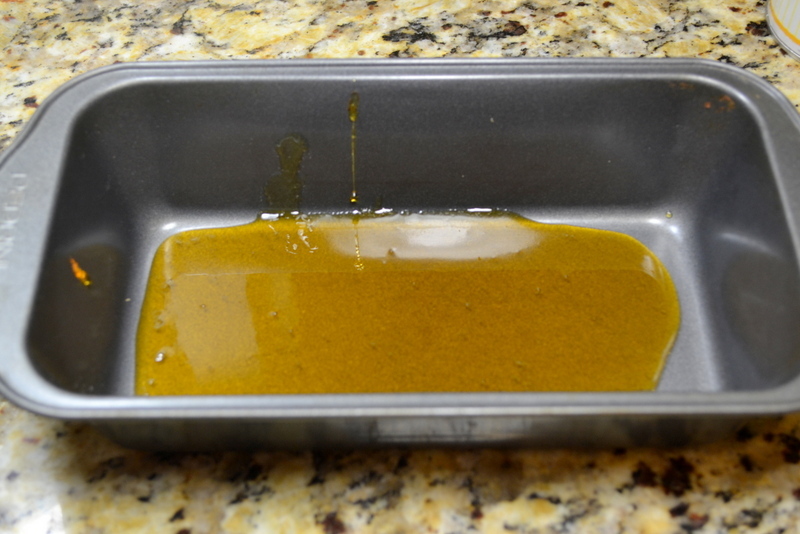 Empty caramel into an 8-1/2″ x 4-1/2″ loaf pan (mine was 9″x5″). Do not scrape out saucepan, only allow the liquid to pour by itself. Set loaf pan aside. Set a rack to the middle of your oven and pre-heat to 300-degrees. Fold a dish towel so that it will evenly fit in a 13″x9″ Pyrex baking dish, and set aside. Bring two quarts of water to a boil. Meanwhile in a large bowl, whisk together eggs and yolks. Add sweetened condensed milk, evaporated milk, whole milk, vanilla extract, espresso powder, and salt. Whisk until combined. Pour mixture through a fine-mesh strainer into the loaf pan containing the caramel. Use aluminum foil to tightly cover loaf pan and set in baking dish ontop of dish towel. Put in oven and carefully add the two quarts of boiling water into Pyrex baking dish. Bake for 1-1/4 to 1-1/2 hours until the custard reaches 180-degrees. The center of the custard will still jiggle slightly. Remove foil and allow to completely cool in the water bath; about 1 hour. Once cool, remove from water bath and tightly cover using plastic wrap. Refrigerate overnight of from up to 4 days. 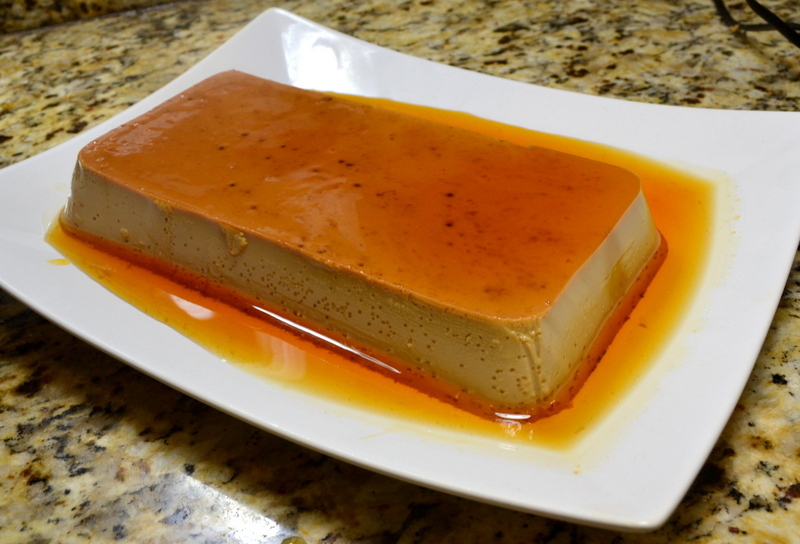 When you are ready to unmold the flan, use a paring knife to slide around and loosed the edges. Invert serving plate ontop of loaf pan, flip over. After it releases, you can use a rubber spatula to scrape and remaining caramel onto the flan. Slice and serve, and any leftovers can be loosely covered and refrigerated for up to 4 days.